From the research team at the University of Guelph Ontario Veterinary College — who have probably done more than any other group to elucidate MRSA in companion animals — comes a look at MRSA infections in dogs. In order to get better data, the team used a study model that is much-employed in human epidemiology — and has often been used for MRSA — but under-employed in veterinary medicine: a case-control study matching MRSA infections against MSSA, or drug-sensitive staph. Studies matching MRSA against MSSA have been able, for instance, to show that certain (human) MRSA infections have higher death rates, keep patients in the hospital longer, and cause more healthcare expense. MRSA is an emerging problem in dogs, and the risk factors for MRSA infections are similar to those in humans, particularly the use of IV catheters and both beta-lactam and fluoroquinolone antibiotics. Infection types for which death would be a more realistic possible outcome were limited... Comparison of mortality rates between patients with MRSA or MSSA infections would be best performed among on ly those with invasive infections and should be considered for future studies. Here, mortality rate information was obtained retrospectively and only recorded up to the time of discharge. Therefore, whether dogs died from their infections after discharge from the referral hospital, causing an underestimate of deaths, is unknown. Dr. Scott Weese, senior author of this paper and chief of the Guelph group, has an excellent blog on infections in companion animals, called Worms and Germs. (It's in the blogroll.) And if you are looking for further information on MRSA in pets, the best resource I know of is the UK-based, but international, Bella Moss Foundation, named for a dog that died of a MRSA infection. From the excellent and forward-thinking research team at Extending the Cure comes a dismaying report: over 7 years, a more than 3-fold increase in resistance in the Gram-negative bacterium Acinetobacter baumanii to its drug of last resort, imipenem. And Acinetobacter is one nasty bug, as science journalist Steve Silberman ably documented in Wired in 2007 when he traced the spread of the organism through the military medical-evacuation chain from Iraq, demonstrating that the vast increase in resistant Acinetobacter among US forces was due to our own poor infection control. susceptible isolates declined from 94.1% to 72.4% — a 23% decrease. 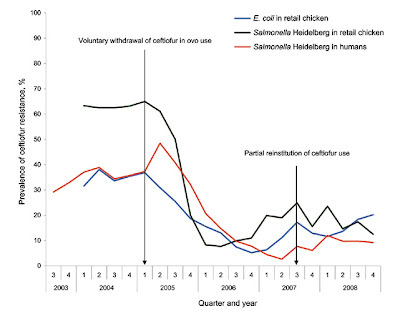 Our results demonstrate substantial national and regional increases in carbapenem resistance among clinical isolates of Acinetobacter species over the period 1999–2006. Increasing carbapenem resistance among Acinetobacter species is particularly troubling, because it is very often associated with multidrug resistance and because it is occurring in the context of increases in the incidence of Acinetobacter infection. There's a further point to be made that is not explicit in the paper that I can see (though it is often made by Extending the Cure researchers). Acinetobacter needs attention, just as MRSA does — but if we focus just on the individual organisms, we are not going far enough. Antibiotic resistance is a system problem: It is an issue of infection control, of drug development, of agricultural organization, of federal priorities. It needs sustained attention and comprehensive, thoughtful, wide-ranging response. Now would not be too soon. From a multi-state, public-private research team — Duke University, Wayne State University, and the Durham, NC VA — comes a precise and alarming calculation of MRSA's costs in hospitals: For one post-surgery infection, $61,681. The group compared the course, costs and final outcome of three matched groups of patients from one tertiary-care center and six community hospitals in one infection-control network run by Duke. The three groups were: patients with a MRSA surgical-site infection; patients with a surgical-site infection (SSI) due to MSSA, drug-sensitive staph; and surgery patients who did not experience infections, matched to the other two groups by hospital, type of procedure, and year when the procedure took place. (This same cohort has been described in an earlier prospective study that looked at risks for MRSA SSIs.) Altogether, there were 150 patients with MRSA SSIs, 128 with MSSA SSIs, and 231 uninfected surgery patients to serve as controls. were more likely to die before 90 days had passed. Our study represents the largest study to date of outcomes due to SSI due to MRSA. Our findings confirm that SSIs due to MRSA lead to significant patient suffering and provide quantitative estimates of the staggering costs of these infections. SSI due to MRSA led to a 7-fold increased risk of death, a 35-fold increased risk of hospital readmission, more than 3 weeks of additional hospitalization, and more than $60,000 of additional charges compared to uninfected controls. For just the patients in this study, the excess costs (across 7 hospitals) totalled $19 million. This is a highly useful study on several axes. First, remarkably, there has not been agreement over whether and how much of a problem MRSA poses in post-surgical settings, particularly when compared to drug-sensitive staph. This study provides careful, thoughtful, well-documented proof that combating MRSA infection is worthwhile. (NB, MRSA infections did not increase the risk of death relative to MSSA infections, which should remind us both of the often-forgotten virulence of MSSA, and also that MRSA's perils can lie in extended illness and disability as much or more as in early death.) Second, by putting a very specific number on the cost of a post-surgical MRSA infection, it gives healthcare administrators a benchmark against which they can judge the cost of a prevention program. We've all heard complaints that prevention programs can be costly and their benefit is hard to measure in a bottom-line way. With this very specific number, that complaint should no longer be valid. There's a final point that is implied in the paper but not called out, so let me call it out on the authors' behalf. These results are very likely an under-estimate of MRSA's costs. That's because, first, the specific procedures the patients underwent were cardiothoracic and orthopedic; those are not the surgical procedures most likely to be followed by a MRSA infection. And second, data collection for this study ceased in 2003, about a year after the first emergence of USA300 and several years before that very successful community strain began its current move into hospitals. However much MRSA was extant in 2003, there is more now. Constant readers — any of you who are Kindle users can now find SUPERBUG the blog in the Kindle store. I placed it there today; it may take 48 hours for it to propagate through the system. SUPERBUG the book will of course be on Kindle as well, in March. Stay tuned! Constant readers, my warmest greetings for Christmas or whatever winter holiday you celebrate! You are high on the list of the many gifts in my life. Thank you for gathering here and contributing to this truly international community of concern about antibiotic resistance. I'll be back early next week with news of two fascinating new studies. Snow-dusted (12" and rising here) holiday wishes 'til then. Constant reader Pat Gardiner guided me to an enlightening post at the website of the agricultural magazine World Poultry that questions the routine use of antibiotics in food animals. It's written by Wiebe van der Sluis, a Netherlands journalist from a farming background, founder of World Poultry and also the magazines Pig Progress and Poultry Processing. The Netherlands, let's recall, is the place where MRSA ST398 first emerged, and also the place where that livestock-MRSA strain has caused the most serious human cases and triggered the largest changes in hospital infection-control practices. In the Netherlands, swine farmers and veterinarians are considered serious infection risks because of their exposure to animals, and are pre-emptively isolated when they check into hospitals until they can be checked for MRSA colonization. Although most of the time MRSA is linked to pig production, it is also related to the veal and poultry industry. The industry, therefore, cannot shrug its shoulders and move on if nothing was wrong. In this case it would be wise to redefine the term prudent use of antibiotics. Time is up for those who use antibiotics to cover up bad management, poor housing conditions or insufficient health care. The standard rule should be: Do not use antibiotics unless there is a serious health issue and no other remedy applies. Veterinary practitioners, who usually authorise producers to use antibiotics, should also take responsibility and prevent unnecessary antibiotic use and the development of antibiotic resistance in animals and humans. It's unusual in the US context so hear someone so immersed in agriculture speak so candidly about antibiotic use. It's refreshing. 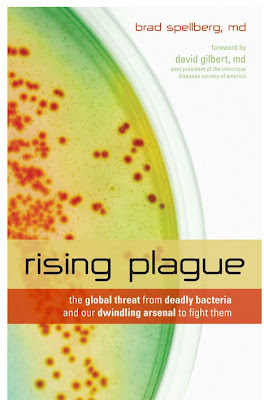 I'm thrilled today to present another guest blogger: Dr. Brad Spellberg, associate professor of medicine at the David Geffen School of Medicine at UCLA and author of the new book Rising Plague: The Global Threat from Deadly Bacteria and Our Dwindling Arsenal to Fight Them (Prometheus Books). This new book is important reading for anyone concerned, as all of us are here, about the narrowing pipeline for new antibiotics against MRSA and other resistant pathogens. That pipeline problem is something Dr. Spellberg knows well: He is not only a practicing infectious-disease physician, but also a member of the Antimicrobial Availability Task Force of the Infectious Diseases Society of America, the specialty society that produced the "Bad Bugs" reports that I've posted on before. Below, Dr. Spellberg thoughtfully answers some questions about the difficulties of treating resistant infections and of developing drugs to control them. From your point of view as a practicing ID physician, why is it so difficult to prevent resistant infections? It's difficult to prevent all infections period. Not more difficult to prevent infections caused by resistant organisms than any other organisms. However, also difficult to prevent the spread of resistance among bacteria that are causing infections. So, why is it difficult? People have this crazy belief that hospital acquired infections are the result of sloppy medicine. Not so. They are the result of very sick people with tremendously sophisticated levels of intensive medical care being delivered in a concentrated environment (i.e., a hospital). Crowd a bunch of sick people together with plastic catheters, mechanical ventilators, and nasty bacteria, and such infections are inevitable. What we are learning is that we have to go above and beyond normal to stop these infections from happening. Research is needed on how best to do this. It's not as simple as people think. You can't stop the spread of the resistance itself. It is inevitable. You say in Rising Plague that physician misuse and overuse of antibiotics is not the cause of antibiotic resistance. What do you consider the primary driver? This is by far the biggest misperception among the public. Let's start from first principles. Who invented antibiotics? Who invented antibiotic resistance? When were both invented? Humans did NOT invent antibiotics. Bacteria did...about 2 billion years ago. And they invented antibiotic resistance at the same time. So, bacteria have been creating and defeating antibiotics for 20 million times longer than humans have even known that antibiotics exist (about 78 years, as the original sulfa compound was developed in late 1931 by Gerhard Domagk). Over the past 2 billion years, bacteria warring among themselves have learned to target virtually every targetable biochemical pathway with antibiotics, and have learned to create defense mechanisms to defeat virtually all such antibiotics. They are already resistant to drugs we haven't even developed yet. It is bacteria that cause antibiotic resistance, not humans. What humans do, is we apply natural selection when we use antibiotics. We kill off susceptible bacteria, leaving behind already resistant bacteria to replicate and spread their resistance genes. This may seem like a subtle distinction: We don't create antibiotic resistance, we just increase its rate of spread. But, from the perspective of effective response planning, this is a critical distinction. If inappropriate antibiotic use caused antibiotic resistance, all we would have to do to defeat resistance is never prescribe drugs inappropriately. Unfortunately, that won't work. All antibiotic prescription, even appropriate antibiotic prescription, increases selective pressure, which increases the rate of spread of resistance. Eliminating inappropriate antibiotic use, and always using antibiotics appropriately is indeed critical, because it will slow the spread of resistance, buying us time to develop new antibiotics. But if 100% of our efforts are focused on antibiotic conservation, all we will achieve is a slowing of the inevitable exhaustion of the antibiotic resource. What is needed is to marry antibiotic conservation with antibiotic restoration. That is, we need new drugs to be developed. Just conserving what we have is not enough. Why are "antibiotic stewardship" policies not a sufficient remedy for controlling resistance? See above. Stewardship leads to conservation. That is half the battle, but by itself it will only lead to a slowing of the inevitable exhaustion of the resource. Furthermore, the initial calls for stewardship were made by people like Max Finland in the late 1940s and early 1950s. This is not a new call. It's more than a half century old. It just doesn't work very well. An analogy is the temptation to say that we don't need condoms to stop the spread of STDs, we just need abstinence. It is true that abstinence will stop the spread of STDs. But, an abstinence-only policy just doesn't work. You've got to have the condoms too. Well, stewardship, by itself, just hasn't worked after more than 60 years of calls for it. It is too hard to change behavior, and the pressures on physicians not to be wrong about their patients' illnesses is too great. What do you consider the chief impediments to developing newer/better antibiotics? The two major impediments are: 1) economic, and 2) regulatory. The primary economic impediment is that antibiotics have a lower rate of return on investment than other classes of drugs. You make a lot more money back on your R&D investment if the drug is taken every day for the rest of the patient's life (e.g. cholesterol, hypertension, dementia, arthritis) than if it is taken for 7 days and then the patient stops because he/she is cured. The regulatory problem is a startling degree of confusion at the FDA regarding what types of clinical trials should be conducted ot lead to approval of new antibiotics. There has been a total rethinking of antibiotic clinical trials at the FDA over the past 5 years. Right now, companies don't know what trials they are supposed to do to get drugs done, and increasingly the standards are calling for infeasible study designs that simply can't be conducted. This revisionist thinking is being driven by statisticians who know nothing about clinical medicine or patient care. They are asking for things to be done that can't be done to human beings. The balance of clinical and statistical concerns is totally out of whack, and must be restored if this problem is to be solved. What types of policies are needed to kick-start development of new antibiotics? Simple. Solutions follow the problems above. For the economic problem, we need Congress to pass legislation that creates special economic incentives for companies to re-enter the antibiotic R&D market. The return on investment calculation must be changed. Antibiotics are a unique, critical public health need. Congress should recognize this. Examples of programs that would work include increase in funding to scientists (e.g. via NIH) who study bacterial resistance and antibiotic development. Increased small business grants to help translate basic science discoveries to lead compound antibiotics. Tax credits, guaranteed markets, patent extensions, and prizes to serve as pull strategies to help companies improve the return on investment for antibiotics. For the regulatory problem, Congress needs to stop hammering the FDA into a state of paralysis, where fear permeates every decision to approve a drug. We should be encouraging a balance between statistical concerns and clinical concerns, and we need to restore a sense that the agency is regulating drugs used by physicians for patients, and that trials showing those drugs are safe and effective must be feasible to conduct and relevant to how the drugs will be used in clinical medicine after they are approved. Constant readers: To my complete surprise, SUPERBUG is up on Amazon! Nevertheless, there it is — and at a lovely pre-release deep discount (34%!) too. Has a nice ring to it, no? Here's something else this scoops me on: the release date. SUPERBUG will be published on March 23, 2010. $17.16, folks. 34% off! How can you go wrong? Via the Fresno Business Journal and the Torrance Daily Breeze come reports of a new study by California's Office of Statewide Health Planning and Development: Known MRSA cases in the state's hospitals increased four-fold between 1999 and 2007, from 13,000 to 52,000 cases per year. Fresno, Kings, Madera and Tulare counties were among 38 counties in California that had 61 to 80% of patients with staph infections. Only one county, Sierra, fared worse. Eight-one to 100% of patients ended up with staph infections in that county’s hospitals. In 1999, Kings and Madera counties were in the 0 to 20% range and Fresno and Tulare counties were in the 21 to 40% range. It's been 10 years since the publication of the pathbreaking Institute of Medicine report, "To Err is Human," which for the first time focused policy attention on medical errors. The Interdisciplinary Nursing Quality Research Initiative has been running a two-week special series of posts to mark the occasion, and they very kindly asked me to contribute. While you're there, please take a look also at another guest post by my good friend Nancy Shute, former staff writer and now blogger for US News & World Report, who discusses the difficulty of speaking up as a patient, based on her own experience in the hospital last summer. It's very worth a read. The New England Journal of Medicine has been running an open-access blog on H1N1 flu, and they've put up a post on when to give antibiotics to prevent secondary bacterial pneumonia, including MRSA pneumonia, in flu patients. For the child or adult admitted to a hospital intensive care unit in respiratory distress, we believe that empirical initial therapy with broad-spectrum antibiotics to include coverage for MRSA, as well as Streptococcus pneumoniae and other common respiratory pathogens, is appropriate. For the previously healthy child or adult with influenza who requires admission to a community hospital and has features that suggest a secondary pneumonia (Table 1), we would recommend empirical treatment with a drug such as intravenous second- or third-generation cephalosporin, after an effort has been made to prove the association with influenza and to get adequate lower respiratory tract specimens for Gram’s stain and bacterial culture. We do not believe that initial coverage for MRSA is indicated in all patients who are thought to have secondary bacterial pneumonia. Development of apparent pneumonia in the presence of flu should be met with antibiotics that will treat drug-sensitive bacteria, along with a test to show which bacteria are causing the illness. If staph is present (or the pneumonia appears very serious), then the antibiotics should be upped to one that can control MRSA. But if the pneumonia is serious enough to send a patient straight to the ICU, then drugs that can quell MRSA should be started right away. For anyone concerned about pneumonia in the aftermath of H1N1, this is worth bookmarking. Wednesday a.m.: Congressional briefing on antibiotics in livestock - live-tweeted! Folks: On Wednesday 2 December, at 9:30 a.m. EST, Rep. Louise Slaughter (D-NY) will host a Congressional briefing about antibiotic use in food animals. As a reminder, Rep. Slaughter is an MPH and Congress's only microbiologist, and the chief sponsor of PAMTA, the Preservation of Antibiotics for Medical Treatment Act that proposes restricting antibiotic use in animals to therapeutic uses under the guidance of a veterinarian and phases out "growth promotion" with sub-therapeutic doses, which consumes millions of pounds of antibiotics every year, many of them close analogs to human drugs. Michael Blackwell, DVM, MPH–former Vice Chair, Pew Commission on Industrial Farm Animal Production; Assistant Surgeon General, USPHS (ret. ); Former Dean, College of Veterinary Medicine, University of Tennessee, Knoxville, TN. Robert Lawrence, MD–Director, The Johns Hopkins Center for a Livable Future, Johns Hopkins Bloomberg School of Public Health, Baltimore, MD. Here's a post explaining the importance of this issue from the blog of the Center for a Livable Future, a Johns Hopkins University research group that has produced some of the most mportant papers on leakage of antibiotic-resistant bacteria and antibiotic residues from CAFOs ("confined" or "concentrated" "animal-feeding operations" — very, very large-scale farms). And here's some video on the issue from last summer from Lou Dobbs Tonight. Because the event Wednesday is an informational briefing, not a hearing, I can't find any link for a live webcast. (I'll update if I find one.) But the hearing will be live-tweeted by the staff of the Center for a Livable Future (@LivableFuture) at the hashtag #CLF09. BLOGGERS: They will take tweeted questions toward the end of the hearing, ~10:45 a.m. — use the hashtag.